A..W Tozer once said that "What comes into our minds when we think about God is the most important thing about us." He is absolutely correct. But that we think about God translates into our words and deeds. It ultimately will define who we are. 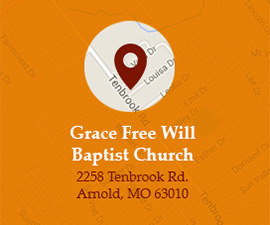 At Grace Free Will Baptist, we believe that the best way you can learn about who we are is to come and see for yourself. It is usually only possible in the context of a community to learn the particular practices, idioms, beliefs, and values of a particular people. That is no less true concerning the church of Jesus Christ. While we welcome you to join us for one of our weekly gatherings as soon as possible, in the meantime you can read more about our congregation's history, doctrine, mission, leadership, and affiliations by reading more under the "Who We Are" heading on the main page.